Meet our Lat45 guides! 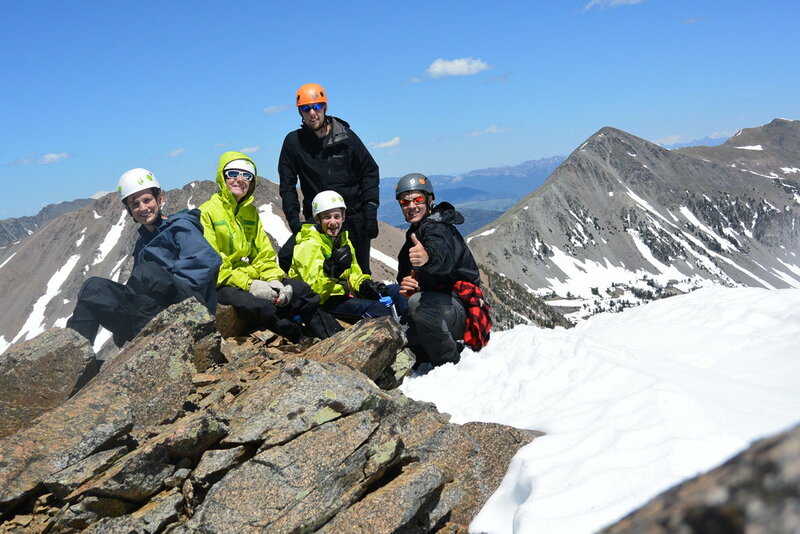 All of the amazing people donate a few weeks of their summer to guide our backcountry adventures. All our guides go through background checks, medical training, and Lat45 training to ensure they are prepared and knowledgeable on situations they may encounter in the backcountry. Favorite Bible verse or book: My favorite book of the Bible is Ecclesiastes because it shows the wisdom in seeking after God and gives us hope in times of trial. Additional information: I am a licensed x-ray tech, an Army veteran and now I work full time with Lat45 because God has called me to do something beyond my wildest dreams. Favorite thing about being a guide: I love being able to see the youth on a trip begin connecting to the incredible size and scope of God's creation with his specific love for them as individuals. Favorite Bible verse or book: Romans 5:3-5 because it is a wonderful picture of our growth as a Christian and has really cool parallels with the experience of climbing a mountain. Certifications: Wilderness first aid, WA state certified whitewater guide, swift water rescue technician, leave no trace instructor, wilderness first aid, Avalanche. Hobbies: Fishing, hiking, camping, etc... Just being out exploring God's creation. When I'm not in the mountains I'm most likely on a mission trip to somewhere. Favorite thing about being a guide: Being able to unplug from the distractions and everything that weighs me down in life. Take a break from it all, go spend time with God in His creation and refocus and recharge. Even better getting to share the experience of everything I enjoy with others. Favorite Bible verse or book: One that stands out to me the most is Ecclesiastes. King Solomon asked God for wisdom and through it gained wealth, power, fame. He had had everything. As his life went on he gave in to a life of self-indulgence. In the end, King Solomon found that trying to find a life of happiness apart from God is meaningless. Coming from one of the wisest people to walk this earth, to me, that's saying something. Favorite thing about being a guide: I love watching these girls accomplish things for the first time that they never thought they were capable of. Favorite Bible verse or book: Psalms; Even though David doubted, sinned, and got discouraged, God chose to use Him. It shows me that whatever our backgrounds and shortfalls, God can bring glory through us if we allow him to. Favorite thing about being a guide: The moment you reach that certain point in the trip, whether it is a destination lake or a summit, the participants thought they never would be able to reach. That moment and the events leading up to it are used to encourage and empower them. That moment and the effort to get there is a great analogy to life and is used to show the participants many different lessons on how to persevere. The smiles on every face in the group makes it all worth it! Favorite Bible verse or book: Isaiah 40: 27-31, Philippians 4: 4-13. Both of these passages are a reminder how we should live our lives by not complaining, grumbling, doubting, or worrying, but in everything looking to God. Favorite thing about being a guide: I'm looking forward to seeing the girls challenge themselves spiritually and physically - digging deep into scripture as well as themselves to grow and change, all the while enjoying God’s beautiful creation. Romans 5:6-8 - This is such a powerful picture of God’s love for us. The love of our Father is deeper than we could ever comprehend! Favorite thing about being a guide: Teaching teens about God, His Word and His creation! Favorite Bible verse or book: All the Bible is favorite to me, but the last year or more I have been especially drawn to Psalm 37:4. Addition information: Love God's Creation (Man & Nature)! Hobbies: Hiking, Hunting, Fishing, working my water dog. Favorite thing about being a guide: The participants getting to see more of God's Creation while getting to see how much stronger they are by being made in God's image. Favorite Bible Verse or Book: John 15:13. I love this verse because it is another portrayal of Jesus' love and that there is no greater love for us than that which Christ showed on the cross. Additional information: I run multiple business and have always had a passion for the outdoors. Hobbies: Backpacking, mountain biking, and anything outdoors. Favorite thing about being a guide: Being out in God's beautiful creation and part of His work. Watching the girls get in the Word, open up, and bond. Favorite Bible verse or book: 2 Corinthians 12:9. I like this verse because it speaks of our amazing position in Christ. His Grace is enough. When our flesh is weak His power is perfect. Addition information: I grew up in Brazil as a missionary kid. I have always loved adventure, traveling, and the outdoors. Favorite thing about being a guide: Witnessing to those who have struggled through everyday life and conquering amazing obstacles while enjoying God's creation. Also, being able to unplug from the stresses and worries of everyday life and have reflection time. All of God's people were called to be disciples. We are given this opportunity called life to explore what God is calling us to do and to lead others to a life with Christ. This, to me, is God saying that no matter how hard life gets, the struggles and hardships we may face, or how alone we may feel, He will never leave us or abandon us. Favorite Quote: "God gives His toughest trials to His toughest soldiers"
If you feel led to explore being a guide we would love to hear from you! Click below to submit your information and we will be in touch to help answer any questions you have.